This recipe is my new dinner party favourite – not only do these little shots look super impressive, but they taste bloody amazing too. Oh, and they’re a great way to use the shot glasses gathering dust in my cupboard given that I haven’t done a shot of anything (aside from wheatgrass) since about 2008. Giving away my age there a bit, but never mind! I ended up creating these by chance the other week – Mr H and I were having some friends over for dinner and I was planning to make a cheesecake but unfortunately my food processor had other plans and decided to take the night off. So with a bunch of avocados and bananas sitting patiently to be magicked (is that a word? It is now!) into creamy deliciousness I turned to my trusty Vitamix (the other love of my life) and hey presto! FYI, you don’t need a Vitamix to make these, any blender or NutriBullet type thing will do just fine. In my opinion, this is the perfect dessert. I’m head over heels obsessed with both cacao and peanut butter, and the two of them together is just a match made in heaven. They went down a storm with our guests too, and Mr H has requested that they make a regular appearance in our fridge, which I’m more than happy to oblige. For the chocolate layers, simply pop the ingredients in your food processor or blender and whizz until a creamy chocolate mousse forms. Try not to eat it all whilst you spoon half of it into shot glasses (or similar) and the other half into a bowl to use for the top layer. 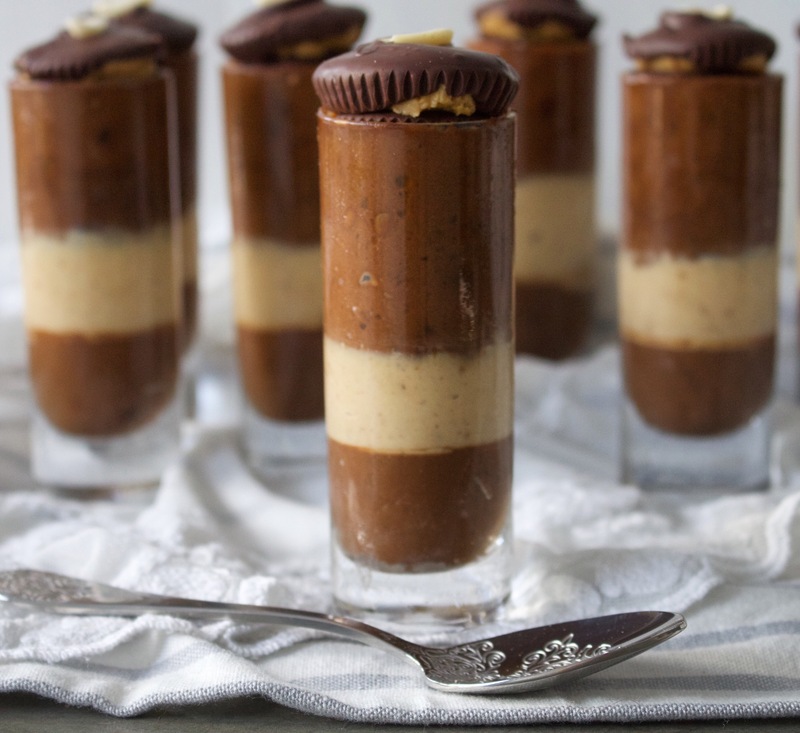 To make the peanut butter layer, again just whizz up the ingredients until you have a creamy mousse. Spoon this into the glasses on top of the chocolate layer, and top with the remaining chocolate mixture. Now for the piece de la resistance – for the PB cups to pop on top, simply melt the cacao butter in a saucepan, and stir in the maple syrup and cacao powder until all mixed together well (NB if you don’t have these ingredients you can just melt down some dark chocolate). 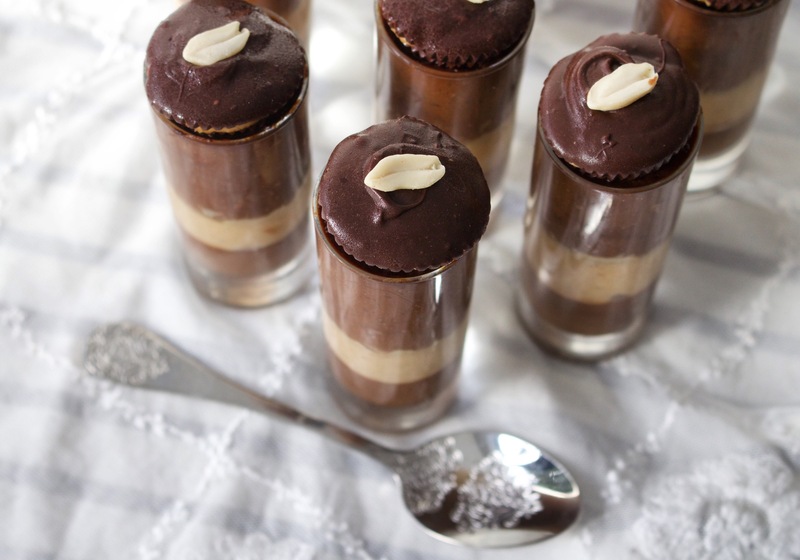 In mini cake cases or moulds, spoon about a tsp of the chocolate mixture into each one and pop in the fridge for 10 minutes to set. Then spoon 1/2 tsp of peanut butter on top, before adding another tsp (or more if there’s space) of the chocolate mixture on top, so that the peanut butter is completely covered. Pop a peanut on top for good measure if you’re feeling fancy, and put them back in the fridge for another 15 minutes to set. 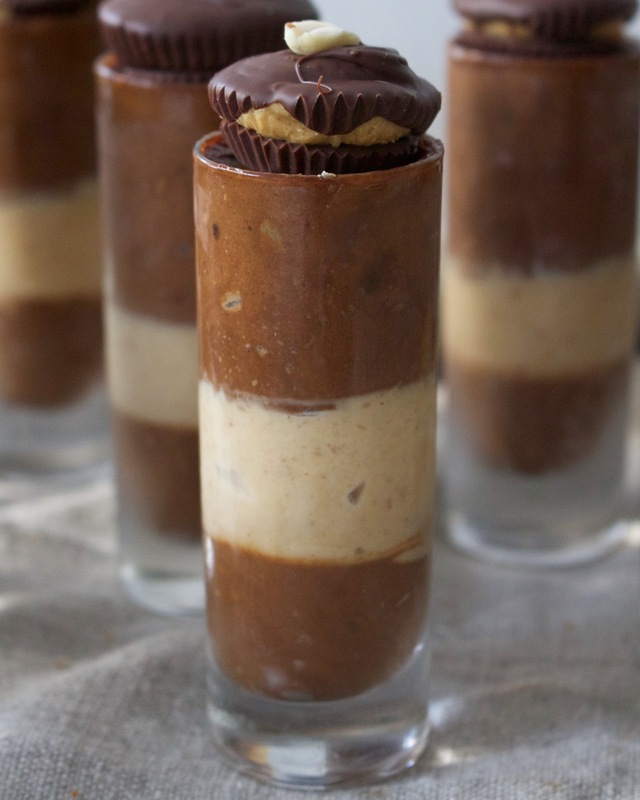 When you’re ready to serve the shots, take the PB cups out of their cases (or moulds) and place them on top. Looks fancy, huh? Just wait until you taste them!